It stunk out my lab, laughed my brother when a Christmas cheese parcel arrived in Washington DC a few years back. I’d added Stinking Bishop to the Murray’s Cheese Shop’s online order because I’d read about it but I’d never tried it. Vicariously experiencing a famous cheese is sometimes enough for a Kiwi cheese nerd. So when I found out about The Stinking Bishops Boutique Restaurant and Cheese Bar in Newtown, Sydney recently, I had to go. Stepping from the brightly-lit Sydney day into the small, darkly decorated space was like descending into a cheese cave, a subterranean treasure trove for the turophile. My kind of heaven. With over 30 cheeses, charcuterie and an open kitchen serving up cheesey delights this was bound to be good. Cheese here is sold fixed priced by the numbers of cheeses on the board. We started with four and there were two standouts. Firstly an Australian award winning goats cheese from Holy Goat Cheese. Wrinkled and ashed I love this style and its bone-white, ash-covered, zesty fudge was great. Second favourite on that board was Tete de Moine, a cows milk cheese from Swiss Jura. A special blade, a girolle, is used to shave frilly rosettes. This increases the surface area and so enhances the smell and taste. I love a cheese with its own special tool. And at last the Stinking Bishop. It came on its own board as I’d ordered it separately. Hailing from Gloucester in the South West of England, it’s a much sought after cows milk, washed rind cheese. A relative of stinky cousins like Epoisse, Vacherin, and Munster, it’s washed in Perry, a pear cider. Some say its name comes not from the cheese’s pungent aroma but the variety of pear. Others say that the perry was originally made by a family named Bishop, one of whom was particularly stinky and drunken. However it got its name it certainly deserves its fame. Threatening to ooze off the board, its matte, peachy rind held its sheeny, buttery-smooth centre in place. 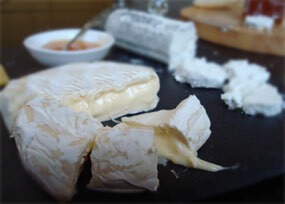 Rich and creamy, it had that sweet umami meatiness that is the payoff for the stinkiness of washed rind cheeses. Even though it has been voted smelliest cheese in Britain and used in a Wallace and Grommit movie to raise the dead, I didn’t really notice the smell. Perhaps it was the loving care the folks here take of their cheeses, perhaps it was that second glass of wine, or maybe in this dimly lit cheese heaven there are no bad smells, just cheesey goodness. Lucy, your photography is so very pungent. Funny that you didn’t find the Stinky Bishop so very stinky. I have been finding that previously very stinky cheeses are not so now. I think it might be because I now know that I like them and just as with good friends I don’t find their smell a big deal? Trouble is I still crave a really stinky cheese. Yep I agree- the smell stops being a big deal once you taste the deliciousness of the cheese. Desensitization!